 BEST PRICES IN TOWN ON NEW & USED TIRES GUARANTEED! WELCOME TO DAVIS MOTORSPORTS IN PICKENS S.C WHERE WE OFFER A FULL LINE OF NEW TIRES COMPETITIVELY PRICED TIRES FROM INDUSTRY'S TOP BRANDS LIKE MICHELIN, GOODYEAR, COOPER AND MUCH MORE! WHETHER YOU DRIVE A PASSENGER CAR, MINI VAN OR A 4WD TRUCK OR SUV SAFETY IS NOT A FACTOR THAT SHOULD BE OVERLOOKED WHEN IT COMES TO YOUR VEHICLE. YOUR VEHICLE NOT ONLY NEEDS SAFE ENGINE PARTS OR BRAKE PADS BUT IT ALSO REQUIRES A SET OF RELIABLE TIRES TO KEEP YOU AND YOUR FAMILY OR PASSENGERS OUT OF HARMS WAY! HAVING A GREAT QUALITY OF NEW OR USED TIRES HELPS WITH THE BUMPS OF EVERYDAY DRIVING THAT MAY CAUSE YOUR TIRES TO GO OUT OF ALIGNMENT LEADING TO LESS TIRE WEAR AND REDUCED GAS MILEAGE! WE OFFER USED TIRES MOUNTED AND BALANCED WITH A 15 DAY GUARANTEED WARRANTY FOR ONLY $23.OO! SO COME LET DAVIS MOTORSPORTS HELP YOU WITH ANY OF YOUR VEHICLE 'S NEW & USED TIRE NEEDS! AFTER PIC OF BUMPER JOB ON FORD MUSTANG SALEEN! 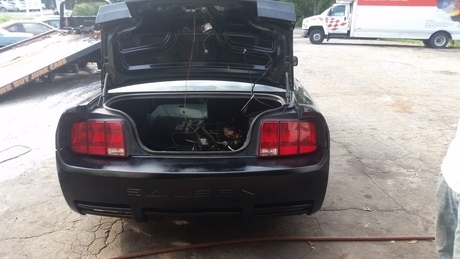 THIS IS THE AFTER PIC OF THE BACK BUMPER WORK ON FORD MUSTANG SALEEN!